DAR Regent Flora Byars Calaway, left, and Scholarship Chairman Tanya McGlothlin, right, congratulate scholarship winner Faith Marschke. 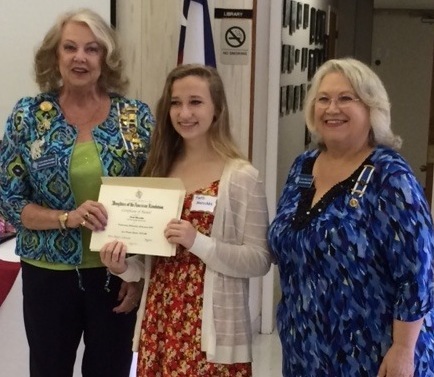 Clear Brook High School senior Faith Marschke was honored at the April meeting of the National Society of the Daughters of the American Revolution- Sam Houston Chapter, which presented her with its 2015 scholarship award. The award recognizes a student in the Clear Creek School District whose essay is exemplary. The award also considers academic achievement, outstanding extracurricular activities and service to the community. Faith, who loves mathematics, has been accepted at University of Texas in the McCombs School of Business for next year. She also is a member of the water polo team. Her senior government teacher, Ms. Fran Lopez, and her kindergarten teacher, Mrs. Vernau, along with her parents, were present at the award ceremony. 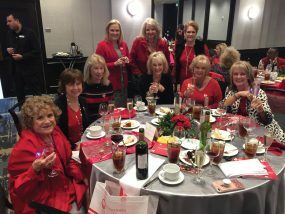 The DAR’s next event will be a luncheon May 2 at Bay Oaks Country Club in Clear Lake.